With everything your chain goes through, with all that gets thrown at it during a ride, you need a specially formulated chain cleaner to keep it at its best; the cleaner it is, the more efficient your chain will be. Suits direct or device application. 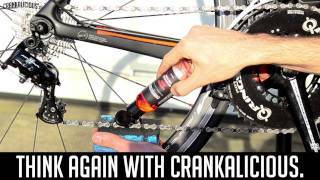 With the high performance Crankalicious Gumchained Remedy Chain Cleaner, you will get it pristine every time. 1. Pour Gumchained Remedy directly into your chain cleaning tool, or onto a chain cleaning sponge. 2. Clasp the sponge or device around the chain and turn the pedals backwards for 30-60 seconds. 3. Dry chain with clean cloth, then re-lube entire drivetrain. N.B. For heavily soiled chains, use neat. For regular cleaning, dilute with water 1:1 (half chain cleaner, half water).